The slightly portentous-sounding title references the late Indian artist Nasreen Mohamedi, whose most notable work, says the New York Times, includes “linear pencil and ink drawings on graph paper, which suggest receding perspectives and lifting-off futuristic forms.” It is abstract, minimalist, and, from the little I’ve seen prompted by this intriguing recording, rather beautiful. 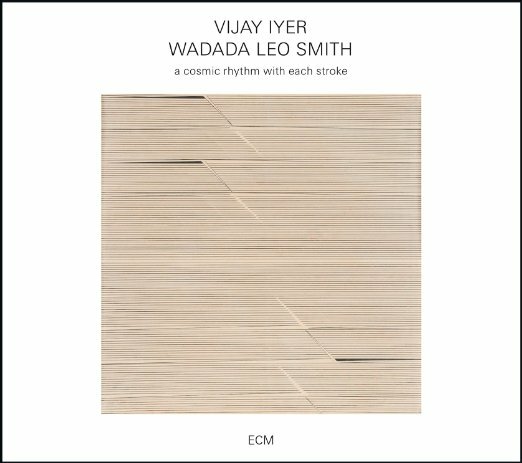 You can see why it might appeal to improvisers, especially players interested in space and texture like pianist Vijay Iyer and his elder, friend, and long-standing mentor Wadada Leo Smith. They worked together in an edition of Smith’s Golden Quartet and their collaboration here draws on that long mutual understanding. There’s no need to contemplate Mohamedi’s work to appreciate the music – Iyer and Smith have done that for you. That led them to the seven-part suite that takes up most of the playing time here. It is topped and tailed by two separate compositions, one from each player, but to me the set sounds all of a piece. Smith’s trumpet is stately and finely nuanced throughout, and consistent in his general avoidance of fast tempos or easy intervals. His musical compass is beautifully accurate, so that there is something very clear-sighted about his extempore lines, as if he can scan many destinations from a distance, choose one, and chart a path confidently, without missing a step. Iyer contributes mostly gentle piano accompaniment, note clusters that offset the horn, background ripples, thoughtful responses to the trumpeter’s statements, occasional interjections that announce a new direction. A little light electronics colours some of their exchanges, and at times supplies the simplest pulse. Their conversation has an appealingly confiding tone at times, and can be brooding, but is mainly quietly celebratory. And yes, it does seem to have some of the qualities of the paintings. But while crossing domains, let's try a different one. If this recording were a bottle of wine, it would be a crisp white: flinty, dry, best served chilled, but with a subtle bouquet. Not everyday drinking, perhaps, but worth laying down.